Planetary Mystery: How in the World Did Mercury Form? It's not easy being Mercury. In a solar system swirling with gas giants, ringed worlds and the cosmic garden that is Earth, the first planet is also the forgotten one. The smallest of the sun's litter  a new indignity since even tinier Pluto was drummed out of the planetary ranks in 2006  Mercury measures just 3,032 miles (4,880 km) across and has had a hard go over the past 4.5 billion years, being slow-roasted in an orbit just 36 million miles (58 million km) from the fires of the sun. Mercury's hostile environs and barren surface have not earned it much love from Earth. With the exception of three flybys by the Mariner 10 spacecraft in 1974 and 1975, no NASA probe had bothered to pay a call. That changed in March of this year, when NASA's Messenger spacecraft, launched in 2004, settled into orbit around Mercury, beginning a close-up survey of the planet that should last at least a year. This week, in an opening flurry, papers from the first few months of study were published in the journal Science, and they are already upending some longstanding beliefs about the mysterious world. For all its bland, moonlike appearance, Mercury is a very quirky place. On its sunward half, the planet sizzles at a temperature of 950°F (510°C) while its night side maintains a brisk 346°F (210°C). Mercury's innards are curious too, with a solid iron core that measures more than half the planet's diameter. Earth, by contrast, has a solid core that's just 9.5% of its overall girth. The planet's eccentric physical features were always thought easy to explain: it probably started off more closely resembling its sisters Venus and Earth, but the nearby sun simply blew off its outer layers. If that wasn't the answer, a collision with a passing planetesimal could have done the same damage and left the same results. The new Science papers, however, suggest that those two theories may have to be scrapped. 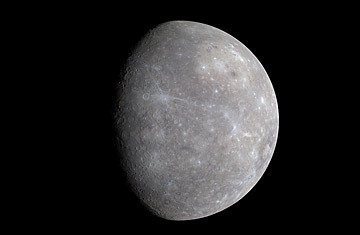 Messenger's studies of Mercury's past involved using the ship's gamma-ray spectrometer and X-ray-emissions detector to analyze the composition of the planet's surface. The key elements the scientists were looking for were potassium and thorium. Both are abundant throughout the solar system, but they are also volatiles, which can exist only under certain conditions. One of the things likeliest to make volatiles vanish is heat. Both the solar-boiling and collision theories of Mercury's origins estimate that the surface of the planet would have reached temperatures up to 5,800°F (3,200°C). At that level of heat, however, potassium and thorium would have evaporated and uranium would have been depleted as well, combining with oxygen to form UO3. But that's not what Messenger found at all. Instead, Mercury's ratios of all three elements are very close to those of the other rocky planets  Venus, Earth and especially Mars. "The planet's volatile budget," wrote the researchers, "is similar to that of [the other] terrestrial planets." The volatiles that did dissipate from the surface may help explain another of Mercury's more idiosyncratic features: a scattering of hollows across its surface. Not quite craters, the formations are shallow and irregular and lack the rim that usually forms when a pit is carved out by an impact. What's more, they look fresh  or at least fresher than actual craters, which can be exceedingly old by geological standards. When a second team of scientists studied similar gamma- and X-ray data, they concluded that the hollows were probably formed by isolated pockets of volatiles created by early volcanoes. Over time, those elements evaporated, leaving an impression behind like a bubble popping on the surface of a dish of cooling pudding. "These features," the researchers wrote, "support the inference that Mercury's interior contains higher abundances of volatile materials than supported by most scenarios for the formation of the ... planet." In other words, Goodbye to the impact and boiling theories. The other papers in the Science package reveal other intriguing details: Mercury has a magnetic field like Earth, but it's a weak one, and the magnetic pole is tilted about 3 degrees from the geographic pole; it has a population of charged particles swirling around it as Earth does, but the magnetic field is not powerful enough to organize them into anything like Earth's Van Allen belts; plains in the Mercury's northern hemisphere were formed by volcanism, meaning Mercury was geologically more active than once believed. While all these new findings are thrilling to planetologists, it's the riddle of Mercury's formation that is rightfully getting the most attention. The question, of course, is, If both prevailing theories are fatally flawed, what's the best alternative theory? And the answer  wait for it  is, Who knows? Messenger has at least five more months of work left, and in that time, investigators may discover some fresh clues to explain things further  but they also may not. As is the case with all science, demolishing an old explanation does not necessarily mean you're ready to replace it with a new one. It does mean that you're at least a little bit smarter than you were before. CORRECTION: An earlier version of this story erroneously stated that Mercury's rotation rate matches its revolution rate. In fact, the planet rotates three times for every two orbits around the sun. See more of TIME's space and astronomy coverage.